Installation of a central air conditioning unit in Greensboro is a job that is extremely critical to the efficient operation of your system. Proper installation will ensure the best performance from your air conditioning system. Poor installation can cause your air conditioner to break down more often and run less efficiently. Find a reputable contractor who can recommend the best air conditioning unit for your home and install it correctly. One of the most common mistakes that is made when installing a new central air conditioner is incorrect size. It is crucial that a thorough assessment of the home is done in order to determine the right sized air conditioner. An air conditioner that is too small will not be able to fully cool the home and keep it comfortable. The system will have to run harder and more often, which will shorten its overall lifespan and require more repairs. It will also be less energy efficient and cause energy bills to go up. An air conditioner that is too big will have problems with humidity control and will be more expensive to run. Another part of installation that can be an issue is the size of the ductwork. The same assessment that is done to determine the size of the air conditioner should also be used to determine the size of the ductwork. Improperly sized ductwork can cause too much or too little airflow in and out of the unit. This can cause your compressor to be overworked, resulting in early equipment failure. It will also impede efficiency. A common problem that can occur with the ductwork is poor sealing. If the ductwork is not properly sealed, the cool air that should be blowing out of your vents to cool the lived in rooms in your home will escape into the attic or some other area instead. Of course this causes poor cooling of the home and higher energy bills. Condensate drains are an important part of air conditioning installation that is often done wrong. If excess moisture cannot drain properly out of the AC unit it will cause humidity in the home and will eventually cause other problems. Also, if an emergency drain pan is not installed, any water that overflows from the main drainage pan will leak out into walls and ceilings causing damage to drywall and other problems. Sometimes air conditioner installation in Greensboro is done with an incorrect level of refrigerant. Refrigerant level has to be very accurate to ensure the best performance from an air conditioner. If the refrigerant is low by even 10% it will cause the energy bill to go up by 20%. With so many things that can go wrong with installation, be sure to hire a reputable company to do yours. 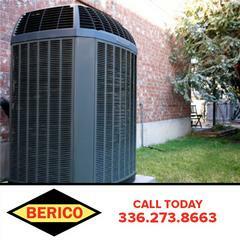 Berico Heating and Air Conditioning has been serving Greensboro since 1924. Certified Berico technicians will accurately assess your home to be sure that the right size system is installed in your home. They have the experience necessary to install the ductwork properly, as well as the drains and refrigerant. You can rely on Berico to do it right the first time.